family-built company. 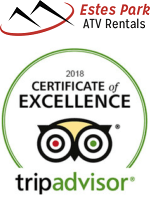 All our rentals are available for anyone looking for adventure in and around Estes Park, Boulder, Denver, Fort Collins, Colorado Springs and Steamboat. When you rent a Jeep, Street bike or Enduro bike, you can experience Trial Ridge Road in Rocky Mountain National Park or any of the many mountain canyon roads in and around Estes Park. For all off road all-terrain vehicles rentals our maps, helmets and gas are already included in the price. The spectacular views that can be accessed with our rental vehicles are unique to the Colorado Rocky Mountains. We are the #1 ATV, Jeep, Minivan or Motorcycle rental company in Northern Colorado. Gas, maps and fun included / Price is per unit / Damage Protection not included. 25 Years or older to rent with credit card, drivers license and full coverage insurance. 21 Years or older to rent with credit card, motorcycle license and full coverage insurance. 25 Years or older to rent with credit card, motorcycle license and full coverage insurance. All 16-21-year-old drivers must have a drivers license to drive. 16-20-year-olds must always have a 21-year-old or older with them to drive. Must be 21 or older to rent. Half-day rides are 3 hours. Full-day rides are 6.5 hours. Must be 25 or older to rent and have a driver’s license, motorcycle license and full-coverage insurance.